The one thing most people wish to see or hear from a team of paranormal investigators is usually the evidence. Without evidence you have no credibility. We were lucky enough to collect evidence on our very first three investigations, which was a tremendous boost to my confidence and it inspired me to carry on and continue doing paranormal investigations, or missions. Below are links to the three pages of evidence we've collected so far. At times, I may fall behind and the pages might require updating. For that I apologize, as I am usually a very busy person with running three different websites, several Facebook pages, writing books, painting my "masterpieces", doing paranormal investigations, going over the evidence, and spending time with my lady love. 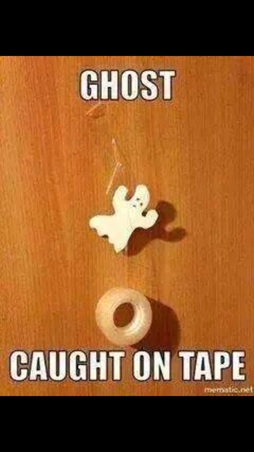 Okay, maybe this isn't what you had in mind, but it is a ghost caught on tape. Is it not? ARE YOU INTERESTED IN READING ABOUT MORE HAUNTED LOCATIONS IN YONKERS? IF SO, GHOSTS AND LEGENDS OF YONKERS MIGHT BE THE BOOK FOR YOU. WRITTEN BY YONKERS GHOST INVESTIGATORS TEAM LEADER JASON MEDINA AND PUBLISHED BY THE HISTORY PRESS, AN AFFILIATE OF ARCADIA PUBLISHING, FOR THEIR HAUNTED AMERICA SERIES, THIS BOOK FEATURES SEVERAL ALLEGEDLY AND CONFIRMED HAUNTED LOCATIONS THROUGHOUT THE CITY OF YONKERS. IT INCLUDES EVIDENCE OF THE PARANORMAL AS SEEN HERE ON THIS WEBSITE, ALONG WITH HISTORICAL BACKGROUNDS AND OTHER HISTORIC IMAGES PROVIDED WITH THE ASSISTANCE OF THE YONKERS HISTORICAL SOCIETY.